It’s time to Spring into Splash for great offers and promotions! We have so many fun things going on at our 19 locations and don’t want you to miss out! Pamper yourself with great deals on us. Become an UNLIMITED Member and receive UNLIMITED car washes and UNLIMITED Club specials, as well as discounts on Five Star and Express Detailing services, all for one monthly fee. But wait, there’s more – buy the Hopper Pass for just $5 extra each month and you can get UNLIMITED washes at any of Splash’s 19 locations! Do you bring your kids with you when you go to Splash? Well, now’s your chance to add to their fun when they come to the car wash. Have them join our Splash Kids Club today! It’s fun for the whole family in every way! Once you wash three times, you won’t believe what’s in store…a FREE prize for your kids that they will adore! Ask a cashier at any of our 19 locations for details on the Splash Kids Club and our ongoing Spring into Splash offers. Want to win a FREE wash from SPLASH Car Wash? Hey KIDS, you can be a winner too! 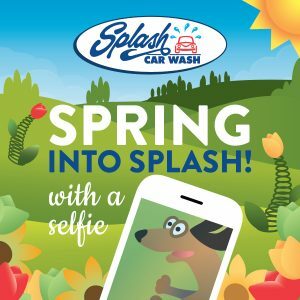 Be sure to upload your photos onto Facebook or Instagram using the hashtag #springintosplash to be entered to win a FREE wash. Kids who upload photos will be entered to win a GIANT rainbow slinky! Start posing! We can’t wait to see your Spring into SPLASH selfies! Remember, your car deserves a better car wash ~ SPLASH!